We ease Idyll Time into the haul-out well precisely at 9:00 AM, our scheduled haul out time at Cracker Boy Boat Yard. As the slings were positioned around the hull, Jeff and I departed IT to nervously watch as she is slowly lifted out of the water and onto the hard pavement. Although we have done this many times now, it is still nerve-wracking to watch as our home is suspended above the concrete. 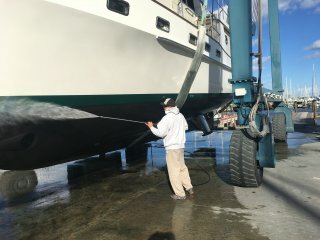 The yard quickly goes to work pressure washing the hull. 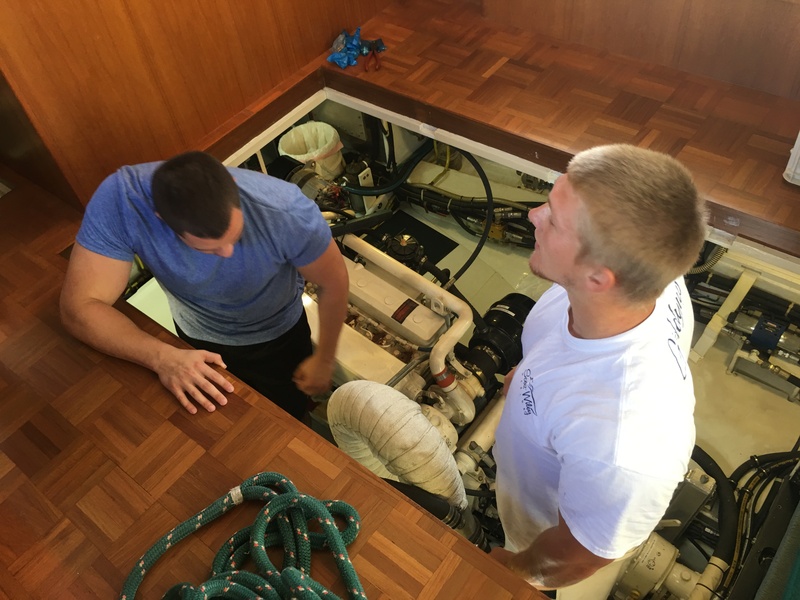 A quick inspection of the hull looks good and we see no visible issues. 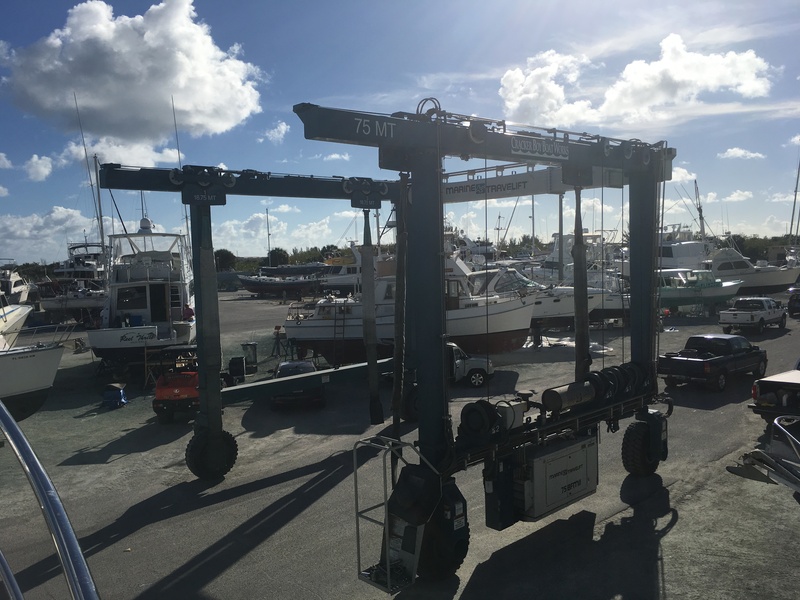 She is soon moved into a side parking spot and the jack stands are positioned and secured supporting the heavy keel. 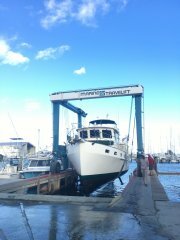 The next ten days are spent boat camping here in the gravel parking lot while Idyll Time gets some routine maintenance. Luckily, the weather has been cool so no air conditioners were needed. 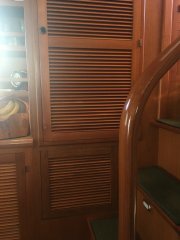 We are able to live aboard while out of the water and do have use of our showers and water while on the hard. It does get quite dusty in the gravel yard and after several days we were anxious to get back in the water. Workers descended onto Idyll Time as soon as she was secure. Tip Tip, the yard’s bottom painter, was fast at work cleaning the hull and all running gear in preparation of new bottom paint. Scotty, our guru mechanic, had driven up from Stuart for the haul out and was soon busy inspecting our prop, shaft seals, and stabilizers. They all looked good so no work was need on any of these items. Scotty then went to work installing our new radar. We are adding a second Furuno wireless radar as a backup. This radar connects through its own wifi to an iPad or iPhone. It will be nice to have a backup just in case something ever happens to our main radar. 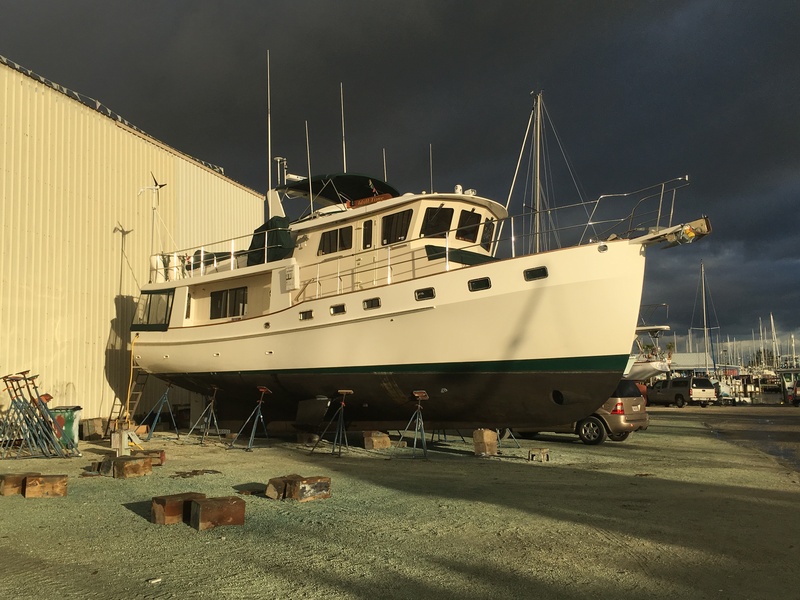 We soon have neighbors at the yard as Changing Course, another Krogen 48 with Bill and Lisa onboard, is hauled out just a few hours after Idyll Time. We enjoy their company over the next week as the work slowly proceeds on both boats. It is nice to have another Krogen owners set of eyes to look at things. Phillip, a skilled craftsman specializing in teak and mahogany boat interiors, is quickly working inside to modify our guest bathroom doorway. Phillip’s woodworking shop is located here at Cracker Boy and was one of the reasons we chose this yard for the haul out. 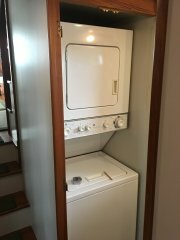 It has been discovered by other Krogen owners that the stackable washer/ dryer combo unit is one inch too wide to fit through the guest head doorway where it resides. 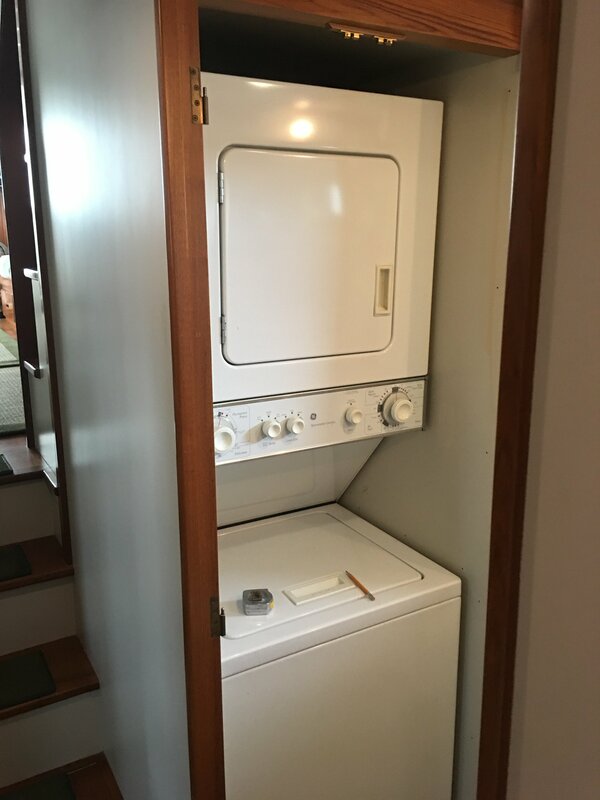 When the time comes to replace this unit, we would not be able to get it out. 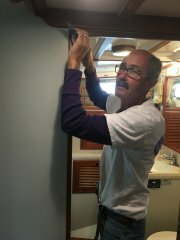 As a remedy on other boats, Phillip has cut the door jamb and made a three inch spacer that can be removed. We have decided to do this now in anticipation of someday having to replace the washer/dryer. Phillip does a great job with this, and you can not even tell the wall has been modified. 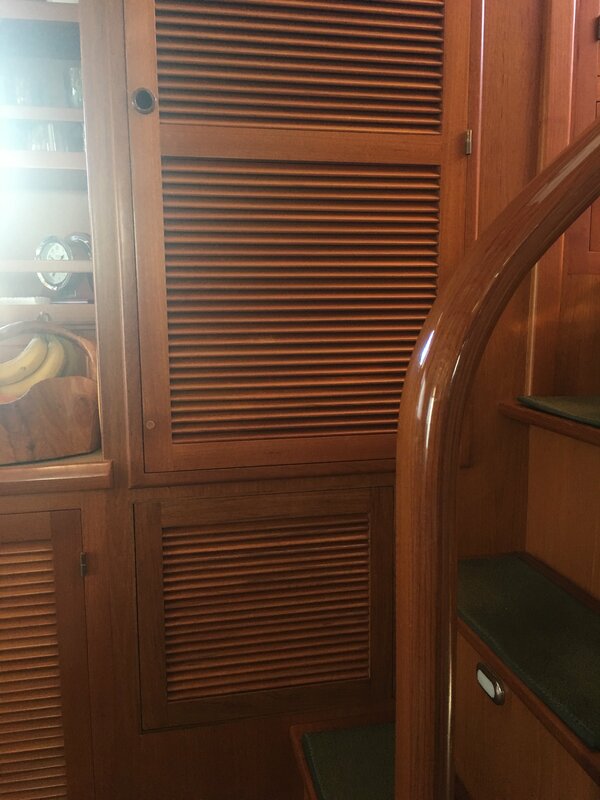 Our second task for Phillip is to add a removable louver panel below our pantry in the galley. There is lots of storage in the bottom of the pantry but it is almost impossible to access. He does a great job and again it looks like the louver was there all along. It will be wonderful to have all the extra storage. 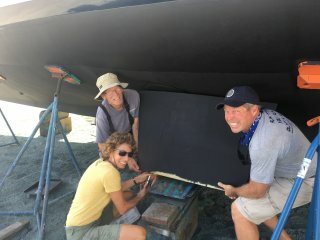 Scotty’s major project is the replacement of all the batteries aboard Idyll Time. She has 5 8D’s weighing 184 lbs. each along with 1 4D battery weighing 120 lbs. We are also adding a sixth 8D to give us a larger house bank allowing us more anchor time before having to run the generator. Phillip modified a battery box to house this extra battery along with a storage compartment above. 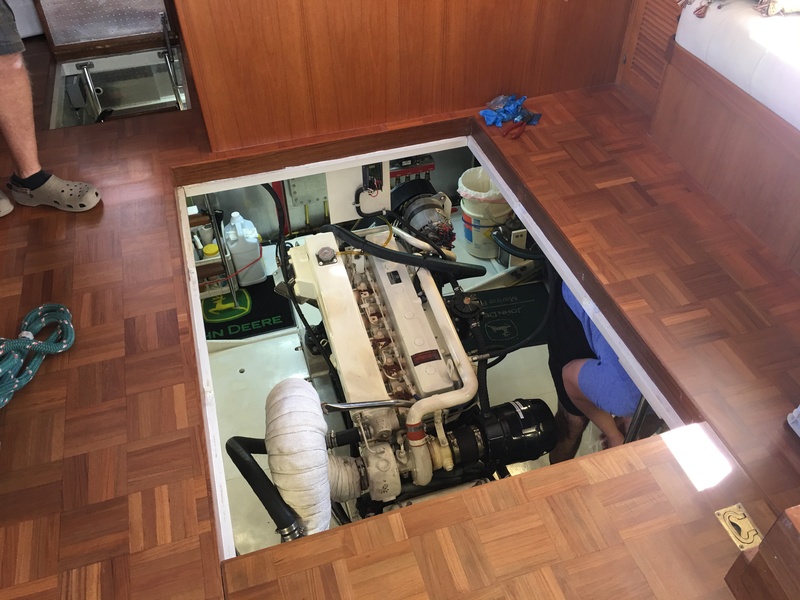 Our saloon floor was taken up for the battery replacement. The “Swamp Boys”, two football players from the University of Central Florida, were called in for the heavy lifting of the batteries. 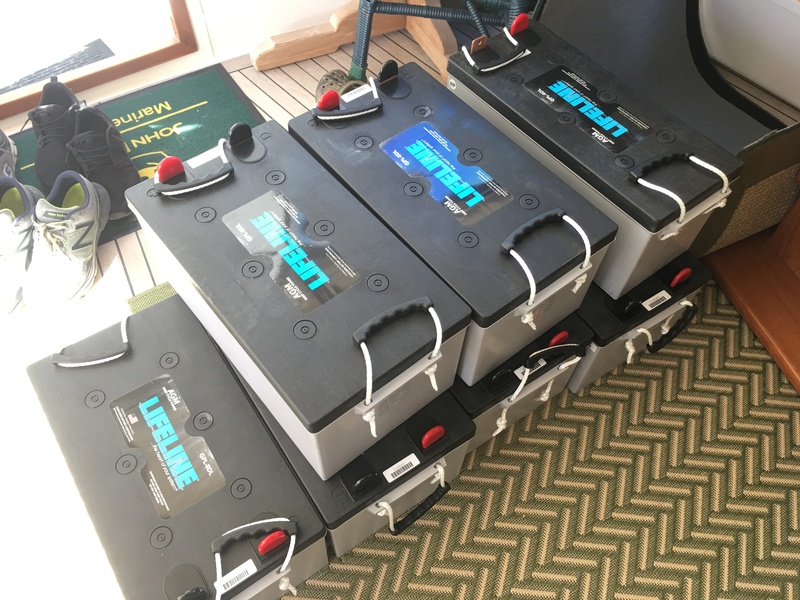 As the forklift lifted the new batteries to the back door of the boat, these two young men swung into action moving the batteries around as if they were empty boxes. For them it was just a good workout. Scotty and Jeff were more than happy to step aside and let them do the heavy lifting. 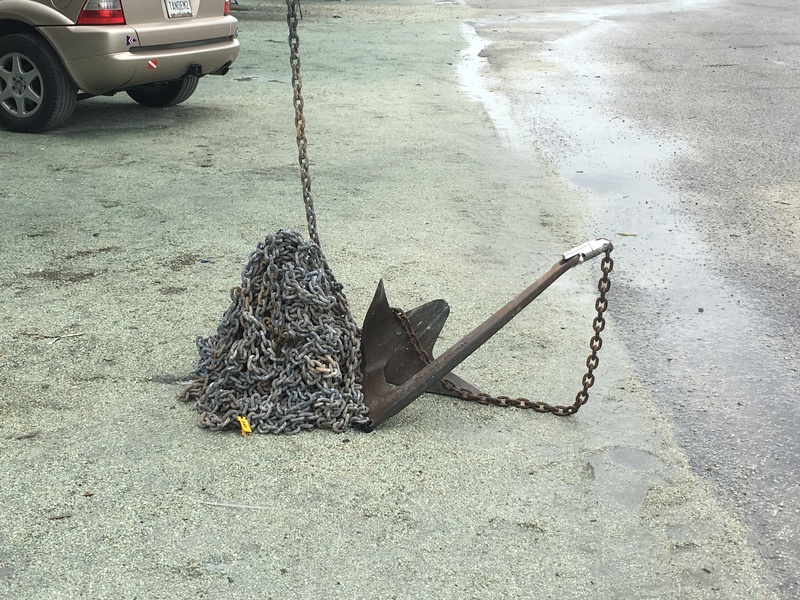 We took advantage of our time out of the water to remark all of our anchor chain. A vinyl tag is placed every 30 feet showing how much chain is let out. 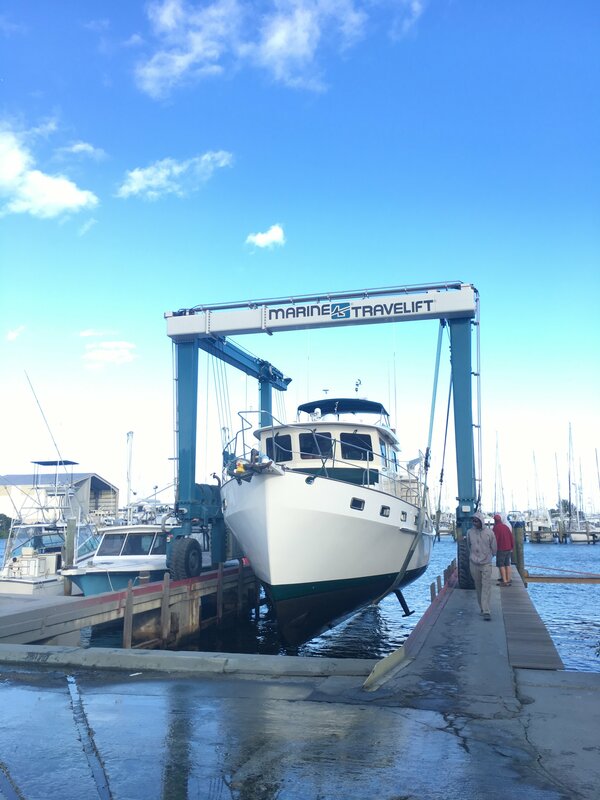 As Tip Tip put the finishing touches on our bottom paint, his brother-n-law, Hazel, began the hard job of waxing both the superstructure and hull. After two days of waxing, IT was again looking quite spiffy. It was a happy sight to see the lift being positioned for our relaunch into the water. After ten days of boatyard life we are more than ready to get back in the water. 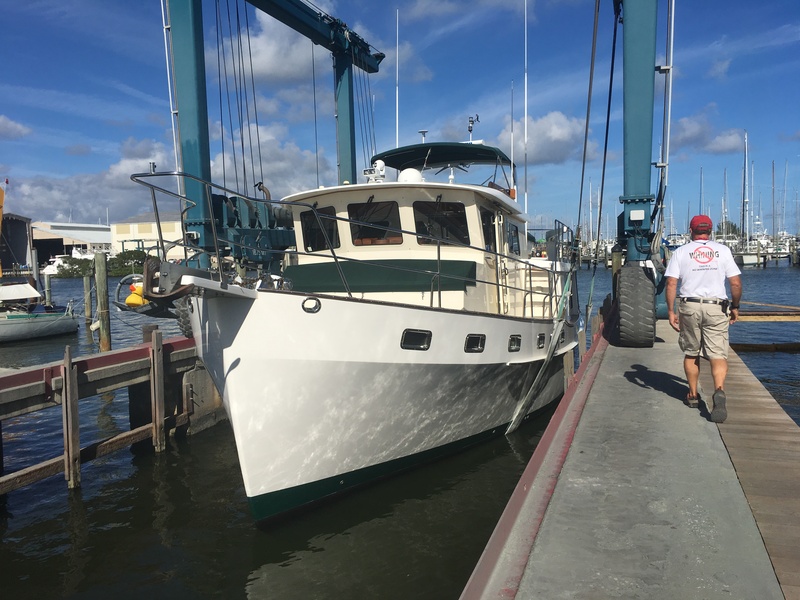 The launch goes smoothly and we are soon underway to our next destination of Stuart, FL. 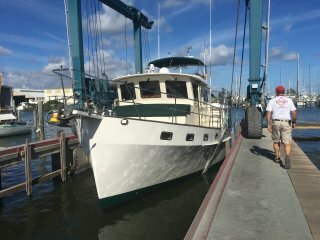 We will be in Stuart for several months as we prepare for the next chapter of our boat travels ( details on that soon). Hope to see you on the water. Thanks for following along! This entry was posted on February 2, 2017 at 10:18 pm. You can follow any responses to this entry through the RSS 2.0 feed. You can leave a response, or trackback from your own site.